If you want to delete your Facebook account for good, then you will be glad to know that there are multiple ways to do it. The process to delete Facebook account on iPhone isn’t much complicated. It is also recommended that you erase Facebook data fragments after deleting your account and uninstalling the app. How to Delete Facebook Account on iPhone? There are two ways to get disconnected from Facebook; you can either temporarily deactivate your account or you can delete it permanently. You can easily deactivate your Facebook account on your iPhone. It is a good option if you just want to get rid of Facebook for a short period of time. You can activate your account any time you want by simply signing in to Facebook again. Launch the Facebook app on your iPhone. Use More option from the top of the app interface and navigate to Settings > Account Settings. Now tap on General option and find Manage Account option. Once there, use the Deactivate option. It will ask you to provide your password. Enter your password and tap on Continue to confirm. That's it! Your Facebook account will be deactivated. As mentioned before, you can easily activate your Facebook account by simply signing in again. The process to delete your Facebook account permanently is straightforward. Keep in mind that this action is irreversible as you won’t be able to recover your account afterwards (15-days period). Use Safari or any other web browser on your iPhone to visit Facebook website and sign in to your account. Once you have signed in successfully, visit https://www.facebook.com/help/delete_account in the same web browser. Now tap on Delete My Account option. After these steps, your Facebook account will be scheduled for deletion. It is a fifteen days period, within these days you can cancel your account deletion request but not afterwards. The primary difference between the above mentioned methods is that deactivating will only disable your account temporarily until you activate it back. 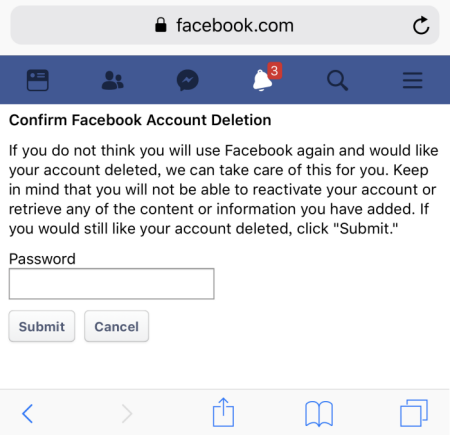 The second method (account deletion) on the other hand, will delete your Facebook account permanently and you won’t be able to get it back once it is deleted. Is it Safe to Simply Delete the Facebook Account on iPhone? Keeping your private data safe is very important. 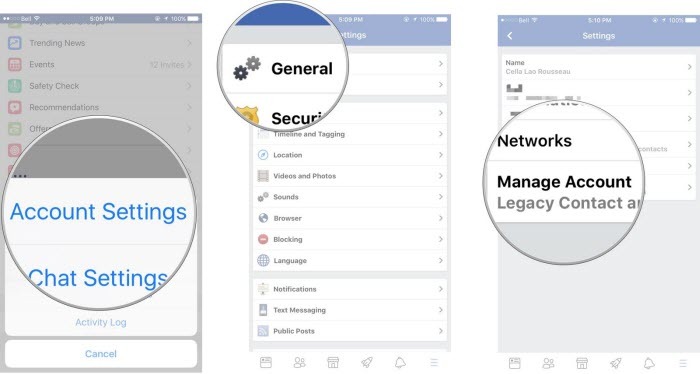 Even though you delete your account permanently and uninstall Facebook app from your iPhone, there are still data fragments of Facebook app that stay behind, containing your private information. Those fragments can be recovered via recovery software and may lead to privacy leak. That’s why, simply deleting your Facebook account and uninstalling the app are not enough, you will have to erase those data fragments as well if you want to be completely safe and protect your privacy. 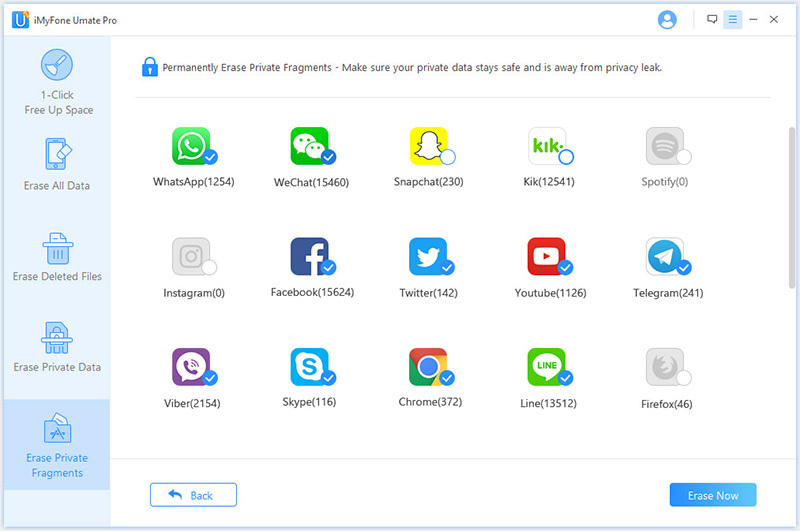 As mentioned above, the only way you can stay completely safe and protect your privacy is by erasing the data fragments left by an uninstalled app (including Facebook). 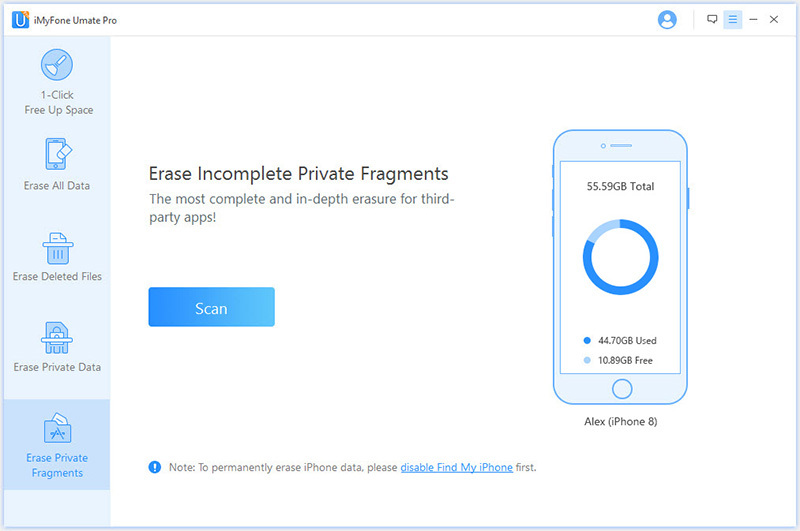 iMyFone Umate Pro is a data erasing tool that you can use to quickly erase such data from your iPhone storage. This tool offers convenient solutions to prevent privacy leaks and protect your private data. No recovery software will be able to recover the data that is erased by Umate Pro. Conveniently erase all types of data (including iOS media as well as third-party app data). Delete data fragments left by uninstalled apps permanently. You can also erase traces of your already deleted files via Umate Pro. Free up your iPhone storage with 1-Click Free Up Space feature. iMyFone Umate Pro is the best tool to erase iPhone data permanently and make your private deleted data unrecoverable. iMyFone Umate Pro is fully compatible with iOS 12 and receive lots of positive reviews from macworld.co.uk, Makeuseof.com , Cultofmac.com etc. Step 1: Connect your iDevice to your Mac or Windows PC via USB cable and launch iMyFone Umate Pro, it will detect your connected iDevice automatically. Step 2: Select Erase Private Fragments tab from the main page of the software interface and then click Scan button. Step 3: Once the scan is completed, you will be provided a list of third-party apps' fragments available on your iDevice. Select the Facebook click on Erase Now button. After the above steps, the fragments left on your device will be erased permanently. How to Remove Icons from iPhone X/8/7/6/6s/5/4? App Won’t Delete on iPhone? Here Are the Solutions!